The Eye of the Dragon! 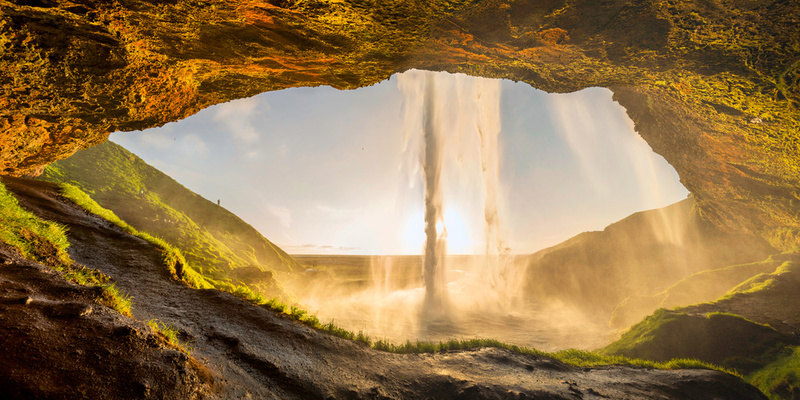 Here's my version of this amazing place behind the Seljalandsfoss waterfall in southern Iceland. It's a panoramic of seven pictures, since I didn't have a lens which were wide-angle enough to capture the entire scene. It's technically hard to capture since water keeps spraying on your equipment. Be sure to bring both a weathersealed camera and lens! My Canon 5Dm3 and 16-35mm F/4, did an amazing job! Hi Mads! I am so pleased to see this unique capture with so much creativity when you decided to use the panorama stitching to capture the entire scenery of this famous waterfall I visited in July 1992. Very good and perfect expose and skillful handling of the very difficult light situation!